In addition, this zoning assures that projects do not cause reduction in groundwater levels on the site or on adjacent lots. Not sure if you're in the GCOD? Click on the image below. Still not sure? Please the BWSC GCOD page here. Applicants in the purple No Harm Overlay Area (as indicated in the above map) shall demonstrate that the Proposed Project complies only with Subsection (b) of Section 32-6 as stated on page 4 of the Article 32 provision. Below are the details of Article 32 zoning provision. ​The GCOD requires that those projects to which it applies obtain a Conditional Use Permit. To get the permit will require an appearance before the Zoning Board of Appeals (ZBA). The Inspectional Service Department (ISD) makes the final determination; check with them for official confirmation. To satisfy the requirement that the project will not cause a reduction in groundwater levels, you will need a stamped letter from a licensed professional engineer registered in Massachusetts. This "no-harm" letter certifies that the project will have no negative impact to groundwater levels onsite or adjacent lots. 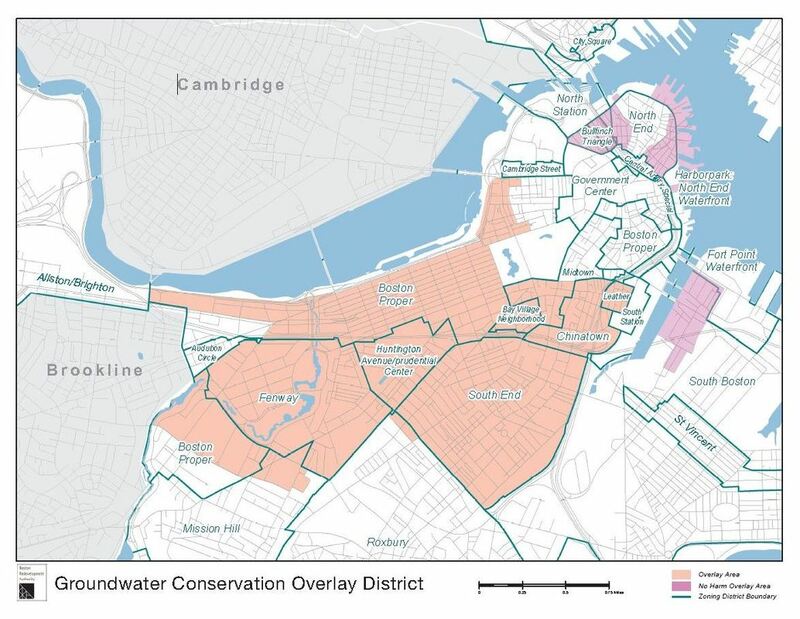 If the project requires groundwater recharge, you will have to submit plans and calculations to the Boston Water and Sewer Commission (BWSC) that show the required amount of recharge capacity, how much recharge is being provided, the location(s) of the supply, and overflow lines along with any connections to BWSC lines. This would typically be included in the site plan submission required by BWSC. For more details on the BWSC site plan requirements please visit here. BWSC will need enough time to review and comment on the submission before your hearing at the ZBA. The ZBA will not approve the Conditional Use Permit before receiving an approval letter from BWSC. The ZBA and the BGwT must have the BWSC approval letter prior to the applicants hearing date. Failure to provide the approval letter prior to the hearing date will result in project deferment. If Article 32 is the only basis for zoning refusal of a permit application within the GCOD, with the exception of projects subject to Article 32, Section 32-4(b), ISD shall immediately issue its zoning refusal. If the applicant files an appeal with the ZBA, then the applicant shall timely submit all required plans, calculations and construction documents to BWSC for a determination that the proposed infiltration systems complies with Article 32. If the proposed project plans are approved pursuant to Article 32 requirements, then the applicant will submit the BWSC approved plans and BWSC Article 32 letter to the ISD Plans Examiner and the ZBA. Upon approval of the Zoning Appeal, the Board of Appeals shall file its written decision within two weeks of the hearing date, and upon expiration of the 20 day appeal period, ISD will issue the Conditional Use Permit. Please remember that no building permit will be issued by ISD until the zoning requirements are satisfied, so it is good to start early on resolving groundwater issues and getting a date before the ZBA. Depending on the backlog at the ZBA, this process can take three to six months. If your project requires other zoning relief, the GCOD requirements will be dealt with at the same time as those requirements. File with ISD for a building permit. The procedural "turndown" letter will tell you that you are subject to the GCOD and must get a Conditional Use Permit by filing an "Appeal" to the ZBA. Appeal forms are issued by ISD. The letter also will advise you of necessary submissions to the BWSC. File the "Appeal" with the ZBA for the Conditional Use Permit. It can take a couple of months before a scheduled appearance before the ZBA, so it is good to start that part of the building permit process as soon as possible. If your project involves any work, such as below ground construction, that could have a negative effect on groundwater levels, have a licensed professional engineer prepare a letter detailing the steps being taken to prevent any reduction in groundwater levels. The ZBA will determine if the letter adequately meets the zoning requirements. For informal guidance , either send the letter to Christian Simonelli at BGwT or have your engineer contact him. If the project requires recharge mitigation, file those plans by a licensed engineer with BWSC as soon as possible. It can take 2-4 weeks for BWSC to review the submission, and any questions they raise will have to be resolved before they will issue a letter to you indicating that your project meets the recharge requirements of the GCOD. Having your engineer meet directly with the BWSC representative may expedite their review as will careful attention to their submission requirements. The BWSC approval letter will be copied to, among others, the ZBA and the BGwT. Submit your plans and the BWSC letter of approval to the ZBA at the Inspectional Services Department desk at 1010 Massachusetts Avenue. At the ZBA hearing, be sure to have your letter from BWSC as well as the letter from the engineer if required. The ZBA will not approve the Conditional Use Permit before receiving an approval letter from BWSC. ZBA hearings are held at City Hall on Tuesdays on the 8th Floor in Room 801. If GCOD is the only reason for your appearance, plan to keep your presentation to that topic only. The ZBA will vote on the Conditional Use Permit at the hearing. After the ZBA votes, the applicant prepares a draft decision letter that reflects the vote. Submit that draft to the Law Department, which will review and correct it for correct legal form. The Law Department will then forward the decision letter to the ZBA. The letter must then be signed by each ZBA member who voted on the application, allowing them to make sure that it accurately reflects the vote. After the letter is signed it is forwarded to the Plans and Zoning department of ISD. It is held there for 20 days, which is the statutory period during which a court appeal of the decision can be filed. After that period, the applicant can get a building permit. The process from filing of the decision to building permit availability can take 4-6 weeks. For more details on the ZBA process please visit here. For more details on the BPDA Zoning Code please visit here.